From Warren Cuccurullo: To celebrate the 10 year anniversary of the NON-RELEASE by an unnamed record label of my concept album 'N Liten Up' we're making it available to everyone TODAY, my 59th birthday. Visit www.nlitenup.com for a trip you'll never forget! WC says "I've been on MTV a lot, but never on DMT. I guess if you could combine them, (DMTV) it would sound something like N Liten Up." Buy it now on warrencuccurullo.bandcamp.com. Happy birthday for Warren Cuccurullo (59) from all wild boys and girls on film in Czech republic! 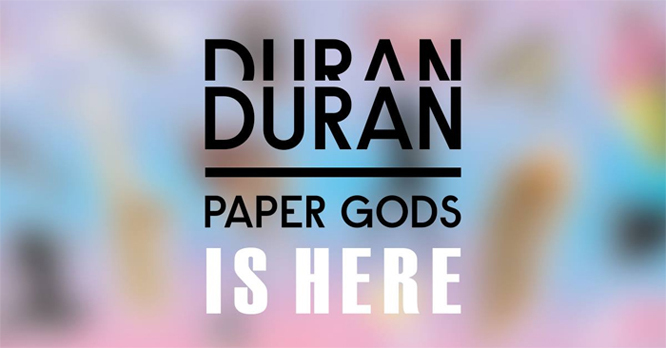 All new lyrics from new album "Paper Gods" are now on duranduran.com. Czech radio Kiss Morava and Duran Duran's Last Night In The City .... it is new song in radio chart ... vote, vote ... for number 1 !!! 2015-09-11 | New album today !!!! Duran Duran's new album, Paper Gods, is out September 11 via Warner Bros. Records. Today, they've made the whole thing available to stream. Listen to new tracks from upcoming album - "What Are The Chances?" and "Last Night In The City". Listen to new tracks from upcoming album - "Paper Gods" and "You Kill Me With Silence". Editor in radio said: "Surprising first place, the fastest jump in first place in last and half year, if I remember correctly..."
Paper Gods will be released in four configurations: as a standard 12-track CD and its digital equivalent, as a Deluxe 15-track CD and its digital equivalent (with three bonus tracks), as a standard 12-track vinyl double LP, and as a limited edition, high end Vinyl Factory Deluxe LP box set. Alongside this, limited edition fan bundles are available at the Duran Duran Music Store which include an exclusive CD with deluxe track listing, special packaging, and a paper fortune teller. The Deluxe version of the album is currently available for pre-order at all participating retailers. In the last few years, the first great pop single of the year has emerged relatively early in the year. Last year, we started to notice a delay in the emergence of new pop music brilliance. “Extraordinary” by Clean Bandit featuring Sharna Bass (2014’s first great pop single) only saw the light of day in April. To say that 2015 has been a tragically underwhelming year for pop music would be quite the understatement. Earlier this year, when we got a short low-quality preview of the new Duran Duran single title “Pressure Off” (featuring Janelle Monae), we had a feeling that these pop/rock veterans just might be the saviors of pop music in 2015. After having listened to a full-length high-quality clip of “Pressure Off“, we are convinced beyond doubt that Duran Duran is here to save the day... more on radiocremebrulee.com. 2015-06-16 | The list of the new songs? 2015-06-12 | Names of new songs? - On whatever day this was done, Nick had left the studio at 3am that morning with Spike finishing the final mixes of the album that had to be done by "today." - Nick is working with Josh on the finishing the bonus tracks at their studio. Not sure what they will be doing with them but at one point, all of them were contenders for the album so they are "really worked on and brought up to their full potential." - By midnight tonight, on whatever day this is, the album will be completed! - On a couple of songs, they did more work on them than they ever did on a song before in their careers. Others came quickly and haven't been changed much from their original creation. - Nick said that he "WOULD THINK" they will play PO at the festival coming up on June 20th (No where did he say they will, however). Rehearsals are starting next week. So at least one, maybe two. Obviously when the album comes out, they'll play more. - Promos have started. As Nick said, "the train has left the station." - All of the group would like to tour India and China as they've never toured there before. - Trying to finish his photographic book off and on (a continuance of "Bei Incubi"). Met with Lori (didn't get last name) but she was the graphic designer for the last Duran album and they have locked down the look. Maybe over the next few months, get that done. The new wave synth poppers Duran Duran announced today that they are to receive the coveted Spotify Lifetime Achievement Award as a nod to their 37-year career. The group will appear at the O2 Silver Clef Lunch Fri 3 Jul to receive the honour, alongside Kasabian, who will receive the Royal Albert Hall Best Band Award at the same event. Info: list.co.uk. 2015-06-11 | New album in September? The third annual Life Is Beautiful Music & Art Festival will invade downtown Las Vegas September 25th through 27th, and this year the fest will welcome headliners Stevie Wonder, Kendrick Lamar, Duran Duran and hometown rockers Imagine Dragons. Hozier, Kid Cudi, Weezer, Death Cab for Cutie and the Killers' Brandon Flowers, a Sin City native, will also be onboard for the fest, which expanded to three days in 2014 after a successful inaugural festival in 2013. In addition to the music, the Vegas fest boasts a world-class culinary lineup, with dozens of the city's top chefs and restaurants setting up shop downtown to feed the festivalgoers. Life Is Beautiful also houses an extensive art exhibition. Tickets for the festival are available now at lifeisbeautiful.com. Read more: lifeisbeautiful.com or rollingstone.com. Bringing some of the world’s biggest live acts to Gibraltar each year, GMF is back in 2015 with its biggest lineup to date in the picturesque and intimate surroundings of Victoria Stadium on the Rock of Gibraltar. Co-headlining will be pop icons Duran Duran. Providing the perfect end to the festival season, GMF is a family-friendly festival in the sunshine. Affordable and easily accessible, Gibraltar Music Festival rolls a holiday and a festival into one incredible weekend. The 2015 Gibraltar Music Festival will be held at the Victoria Stadium in Gibraltar on the 5th and 6th of September 2015. Duran Duran will perform on September 5th. Info: duranduran.com. Duran Duran set sail aboard a 70-foot yacht in the iconic music video for “Rio,” the title track from the British quintet’s second album release in 1982. That hit single, along with others like “Hungry Like the Wolf” and “Save A Prayer,” propelled the album into the Top 10 and kept it on the US Billboard 200 chart for 129 weeks. Today, Rio has been certified double platinum and is widely considered to be one of the greatest albums of the Eighties. Parlophone will have you dancing on the sand this summer with RIO: DELUXE EDITION. The two-CD set will be available at retail outlets on June 22. The collection features the US and UK original vinyl track list, plus a generous selection of alternative mixes, demos and B-sides. All of the music was originally issued in 2009 as part of a limited edition release on EMI that’s now out of print. This new version will be presented in a digipak. A single-disc version featuring the music from the first disc of the Deluxe Edition will also be released the same day. When Rio was released in May 1982, it featured nine tracks mixed from the original master tapes. Six months later, a second version of the album was re-released in North America that replaced many of the original mixes with remixes by producer David Kershenbaum. The first disc of this new collection includes the original album, plus five Kershenbaum remixes for songs like “Hungry Like The Wolf,” “Hold Back The Rain” and “Lonely In Your Nightmare”, enabling the listener to program their CD player to play the original or North American vinyl tracklistings. RIO: DELUXE EDITION also brings together various non-album tracks like the original 7” version of “My Own Way” and a live performance of the 1981 hit “Careless Memories” that was issued as the B-side to “Hungry Like The Wolf.” Additional highlights include Kershenbaum’s remixes — dubbed “Night Versions” — of “Rio,” “My Own Way” and more. Info: duranduran.com. Happy birthday for Roger Taylor (55) from all wild boys and girls on film from the Czech Republic! Duran Duran front-man Simon Le Bon and former England Rugby Captain Mike Tindal MBE who are both motorbike enthusiasts have also joined forces to support the annual motorbike festival which helps raise money for the Midlands Air Ambulance Charity. The ride out will start out at 11.30am on Sunday 26 April from Meole Brace in Shrewsbury with 3,500 bikers expected to take to the roads in convoy before arriving at RAF Cosford where the festival will be under way. Simon LeBon confirms on kiddnation.com new single "Pressure Off" in May 2015 !!!! Duran Duran made a surprise appearance at James Cole Winery's Live In The Vineyard event where they played "Pressure Off," the new single off their upcoming album at the Warner hosted event. Warner Bros. Records (WBR) announced today that it has signed a global recording contract with international superstars Duran Duran. Singer Simon Le Bon, keyboardist Nick Rhodes, bassist John Taylor, and drummer Roger Taylor have just completed work in London on a new studio album, their 14th. Produced by Nile Rodgers, Mark Ronson and Mr Hudson, it is slated for release in September of this year. The first single: "Pressure Off" from their upcoming release features critically acclaimed singer / songwriter Janelle Monáe. The new album also includes guest appearances by former Red Hot Chili Peppers guitarist John Frusciante, and Canadian Juno-Award winning newcomer Kiesza... more infos on marketwired.com. Kiesza was in the studio yesterday with Simon, Mr Hudson and Joshua Blair finishing up the vocal on a track called "Last Night in The City," which they are all super excited about. They recorded the duet yesterday afternoon in North London - right before she started another session. - more than three-quarters way through..."in the last lap"
- no chance of playing a new song at a festival. "When it comes out, it comes out, and that's when you'll hear it." Duran Duran announced live performance: June 28, 2015 - (Killarney Festival), Kerry, Ireland. More info and tickets: killarneyfestival.ie. Happy birthday for Andy Taylor (54) from all wild boys and girls on film from the Czech republic! From dd.com: We’ve always been lovers, not fighters, everyone knows that. So, now that Bestival’s Summer of Love theme is out in the open and our amorous adventures are well and truly underway, we’re more than a little excited to turn our attentions to our first line-up announcement! Featuring our mighty Thursday Big Top headliners and our Saturday main stage headliners, and a litany of party people spreading their love across more than 25 stages in 8 fields of wonderment with mega soundsystems, non-stop parties and 24-hour escapism, this is just the beginning, so don’t miss out; feel the love this September 10th-13th at Robin Hill on the Isle of Wight. The David Lynch Foundation’s performance-based initiative, DLF Live, is proud to announce a one-night only, all-star event entitled The Music Of David Lynch, which will take place at the Theatre at Ace Hotel in Los Angeles on April 1st, 2015. Duran Duran has announced two summer Festival shows today ... and does the new album is scheduled for release this September? War Child and O2 are proud to announce the incredible full line-up, dates and venues for Passport Back To The Bars, a week of one-off events offering incredible access to some of the biggest names in music in the most intimate venues – supporting War Child after an unprecedented year of violence for children in war zones. Artists performing special shows include: Duran Duran, Elbow, Bastille, The Vaccines, You Me At Six and Ride (Mark Gardener and Andy Bell acoustic show). Each will be playing intimate venues including: Duran Duran gracing the splendour of Wilton’s Music Hall, London’s oldest remaining Grand Music Hall.